The Bosco Campus Store is your one-stop shop for Bosco apparel and gifts. Located in the front of the Administrative building, the store features exclusive Bosco styles including men's, women's, youth, accessories and gifts. New items are added regularly! The Bosco Campus Store is open Monday through Friday and for special events. Please check the school calendar for dates and times. Football tickets can be purchased in the Bosco Campus Store or online via the link below. Looking for custom order options? Shop the official Bosco Braves BSN Sideline Store. Select from hundreds of great designs that can be customized based on your relationship to Bosco: alumni year, family relationship, athletic program, club/organization, academic pathway, and faculty/staff. What is the difference between BSN and the Bosco Campus Store? BSN is intended for custom orders, like apparel with names of specific clubs or teams. 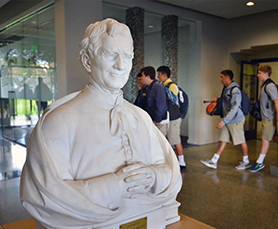 The Bosco Campus Store will continue to be your one-stop shop for Bosco apparel and gifts. All items and logos/artwork featured in the Bosco Campus Store are exclusive to the store, so these items will not be available on BSN. Items purchased in the Bosco Campus Store can also be easily returned or tried on in-store. How long will it take to receive my BSN order? Orders will ship within 7-10 business days of being placed. Can I return items purchased from BSN? Items purchased from BSN cannot be returned since all orders are custom. Returns will be accepted to BSN if an item is defective. The Bosco Campus Store is not able to accept returns of items purchased from BSN. If I have questions about my BSN order, who should I contact? BSN offers a customer service phone number and email address. Visit the BSN online store for more information. The Bosco Campus Store is unable to assist with orders placed on the BSN site.